Yesterday I got a random pack of kindness from TribeCards. 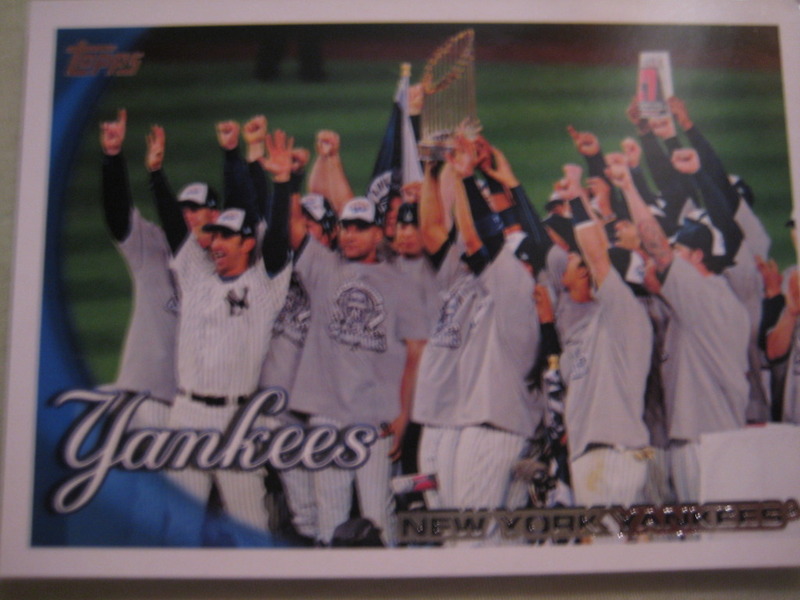 The pack featured all Yankees and was almost all 2010 issues, which is great because I have very few cards from that year, and those cards document the World Championship 2009 season, like this awesome team card from Topps. I have that T-shirt that they're wearing, by the way. 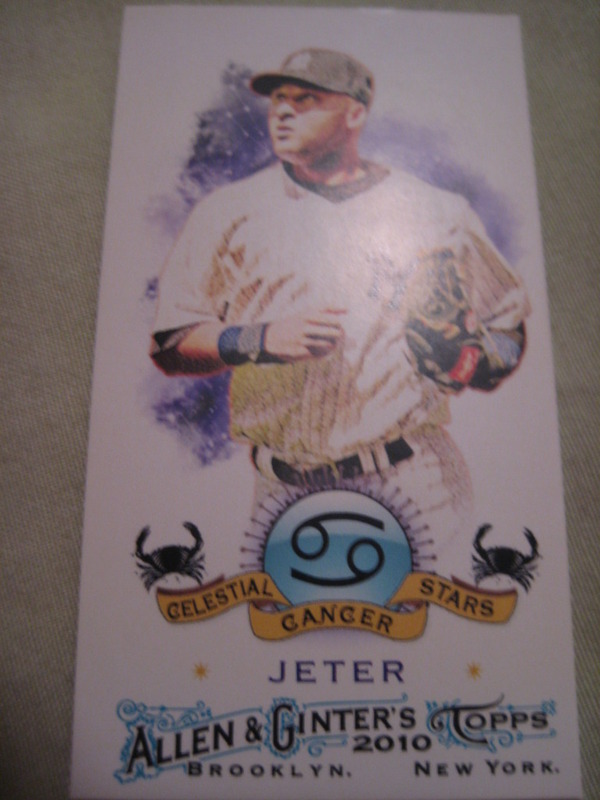 Another cool card is this horoscope card of Derek Jeter. Like Jeter, I have the worst-named horoscope sign ever. Check out the latest This Week in Baseball Cards at the Hall of Very Good! Especially for the vintage Caldor commercials. I have 82 cards of Roberto Alomar. This one is from 1990 Topps All Star Collection. Playing career: 12-time All Star Roberto Alomar is a member of the 2011 Baseball Hall of Fame class. Alomar was the premier second baseman in the American League in the 1990s, a key member of the great Blue Jays teams early in the decade, the great Orioles teams mid-decade, and the great Indians teams late in the decade. He was 63.5 Wins Above Replacement for his career, and hit .313 with an .829 OPS in 58 postseason games. Where he is now: He has his own line of sportswear and fragrances, Second2None by Roberto Alomar. Interesting stories: Alomar has been sued by multiple women for supposedly giving them HIV. I wonder what John Hirschbeck, the umpire he famously spit on in 1996, thinks of that? That spitting incident is one of several blemishes on Alomar’s career; another is his tumultuous time in the Mets, which included a clubhouse altercation with Roger Cedeno about how ugly Alomar looked on his rookie card. Google Autocomplete results: He is seventh when you type Roberto, between Roberto Duran, a boxer, and Roberto Benigni, an actor. There do not appear to be any other prominent Roberto Alomars. Coming up next: The next profile will be Sandy Alomar. I have one card of Wady Almonte, from 1997 Fleer. 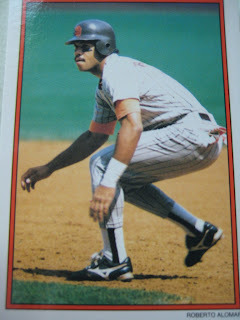 Playing career: Wady Almonte was an outfielder in the Orioles organization from 1994 to 2001, playing two full but undistinguished seasons in AAA in 2000 and 2001. He then played briefly in the Cardinals organization and various independent, Mexican and Italian leagues. Where he is now: Could not find. Anyone know where Wady Almonte is now? My memories: Had not heard of him other than from his baseball card. Google Autocomplete results: He is fifth when you type Wady, between Wandy Rodriguez, the Astros pitcher, and Wadi Definition (A valley, ravine, or channel that is dry except in the rainy season). There do not appear to be any other prominent Wady Almontes. Coming up next: The next profile will be Roberto Alomar. I have one card of Hector Almonte, from 1999 Fleer Tradition Update. Playing career: Hector Almonte pitched in fifty games for the Marlins in 1999 and the Red Sox and Marlins in 2003. He went 1-4 with a 6.27 ERA. He last pitched professionally for the Somerset Patriots in 2008. Interesting facts: Brother of Brewers outfielder Erick Almonte. Where he is now: Could not find. Anyone know where Hector Almonte is now? Google Autocomplete results: He is third when you type Hector Alm, between Hector Almaguer, head of legal at Universal Music Latin America, and Heitor Almeida, Professor of Finance at the University of Illinois. Coming up next: The next profile will be Wady Almonte. I have six cards of Erick Almonte. This one is from 2001 Bowman Heritage. 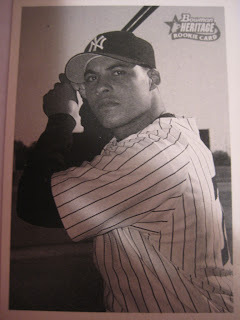 Playing career: Erick Almonte was the fill-in shortstop when Blue Jays catcher Ken Huckaby decided to sit on Derek Jeter’s shoulder on Opening Day 2003, knocking him out for a month. In exactly 100 at bats that year, Almonte hit .260 with 1 HR and 11 RBI. In the field, he made 12 errors in 31 games, for an Eduardo Nunez-like .906 fielding percentage. That was his last major league service until this year, when he resurfaced with the Milwaukee Brewers, going 3 for 29, including a home run, in sixteen games. Interesting facts: Brother of former major leaguer Hector Almonte. In April became the first player ever to go on the seven-day disabled list for concussions. Where he is now: Since coming off the disabled list he has been playing at AAA Nashville, where he is hitting .300 with 6 HR and 39 RBI. Earlier today he hit a double against Memphis. 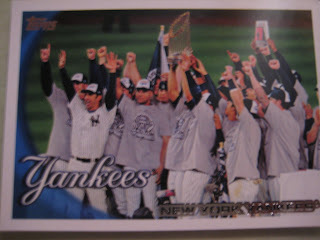 My memories: I remember the Jeter injury more than Almonte’s filling in for him. The Yankees actually did just fine with Almonte in the lineup instead of Jeter, more of a testament to how deep those Yankee teams were than any complement to Almonte. Google Autocomplete results: He is sixth when you type Erick, between Erick Sermon, a rapper, and Erick Aybar, the Angels shortstop. There do not appear to be any other prominent Erick Almontes. Coming up next: The next profile will be Hector Almonte.